Here is the Athletics Team card. 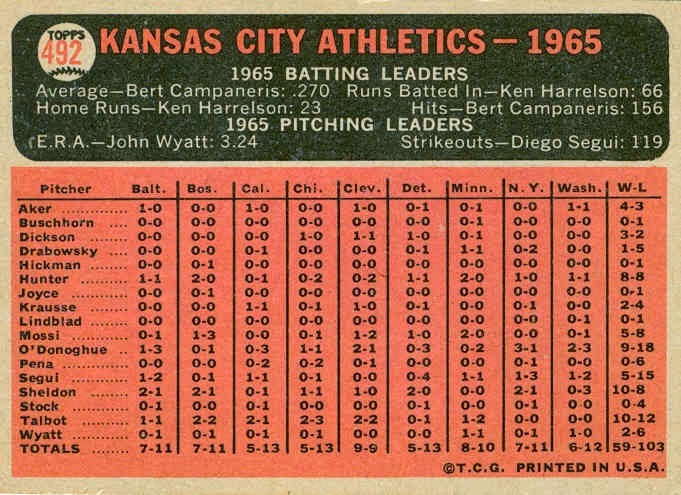 Shown on the card is the 1965 team, the not-so-proud owners of a 59-103 record, which put them 43 games behind the AL champion Twins, and 3 games behind the 9th-place Red Sox. 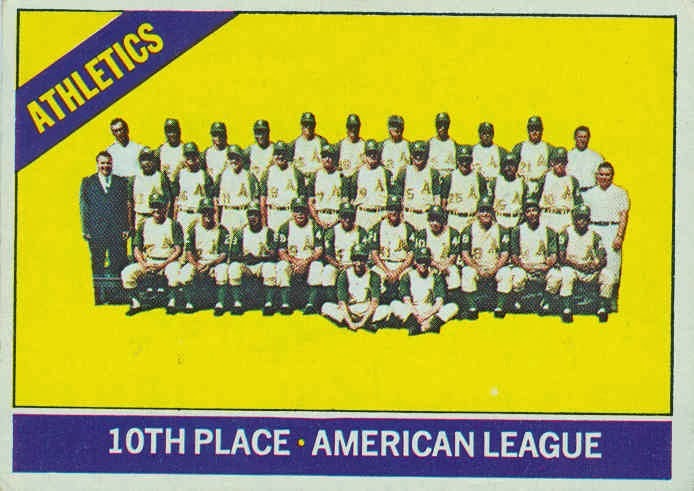 The '66 Athletics improved to 74-86 (7th place), but the entire league improved that season. The last-place Yankees were 70-89, 26 games behind the Orioles. SEVENTEEN PITCHERS! That's what happens when you stink. Rollie Sheldon and Fred Talbot led the team with 10 wins each, but they would be gone by the next year. 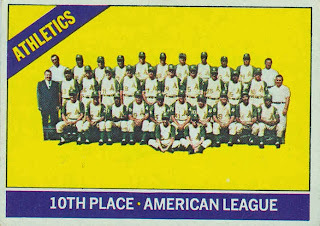 The A's were making some headway though. 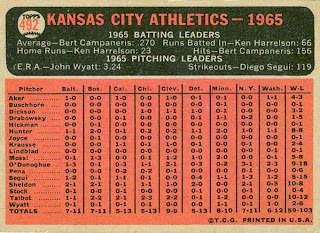 Young starting pitchers Catfish Hunter, Jim Nash, Lew Krausse, John Odom, and Chuck Dobson were gaining experience. 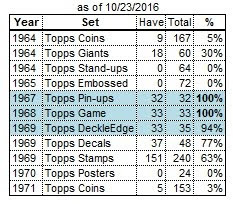 Soon, Rick Monday, Sal Bando, and Reggie Jackson would be joining the team, and in a few years they would have a dynasty. Unfortunately for the fans of Kansas City, that dynasty would be located in Oakland, and Kay-Cee would have to endure the growing pains of the the expansion Royals for another 7 years. 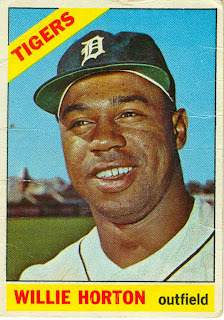 Willie Horton was signed by the Tigers in 1961, and played for 3 seasons (1962-64) in the minors. He made his major-league debut in September 1963, starting 9 of the final 11 games. 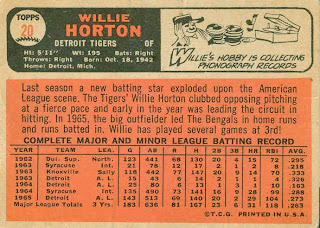 Horton began the 1964 season as the Tigers’ starting left fielder, but by mid-May he was sent back down, returning in September. 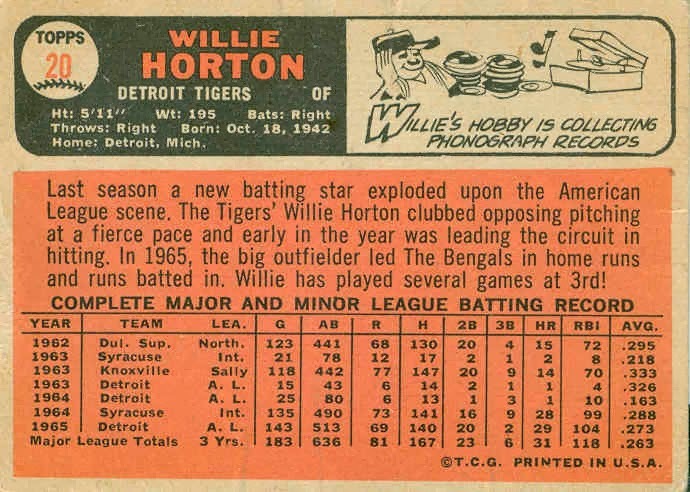 Willie made the starting lineup at the beginning of the 1965 season, and was the team’s regular left fielder from 1965 through 1974 (although he missed significant playing time in ’70, ’72, and ’74). He hit .304 with 1 home run in the 1968 World Series. 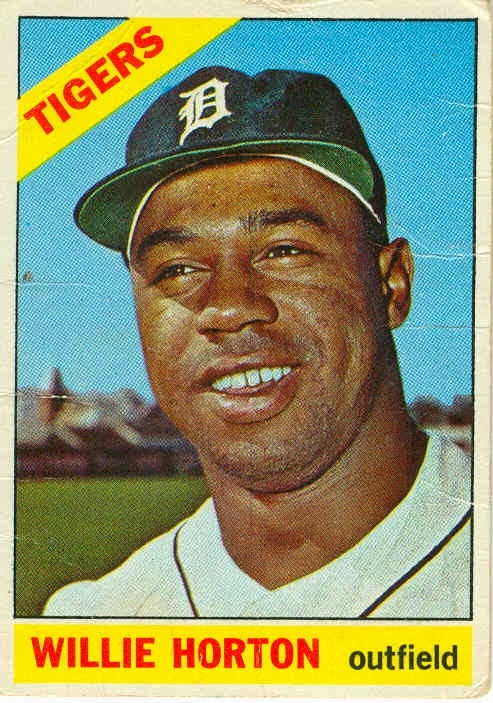 Horton became the Tigers’ designated hitter beginning in 1975, replacing long-time PH/DH Gates Brown. After 2 seasons as the DH, Willie was traded to the Rangers in April 1977 for pitcher Steve Foucault. He played with Texas for only one season. 1978 was a whirlwind for Horton. In February he was traded to Cleveland. In July the Indians released him, and he was soon signed by the Athletics. In mid-August Oakland traded him to the Blue Jays for outfielder Rico Carty. In December, Horton was granted free agency. Willie DH’ed for the Mariners in ’79 and ’80, playing his last major-league game on Oct 5, 1980. In December, he was traded back to the Rangers in an 11-player deal that also included Rick Honeycutt and Richie Zisk. For Willie, it was all moot, as the Rangers released him on 4/1/81. In May 1981, Horton was signed by the Pirates, and played 2 seasons with their AAA team in Portland, OR, then wrapped up his career in 1983 playing in the Mexican League. 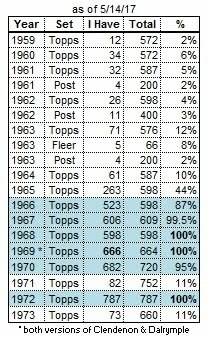 Willie finished with 325 home runs. 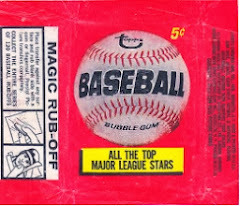 My recollection is that he was a prolific power hitter (though not in the same tier as Harmon Killebrew or Frank Howard). I was surprised today to learn that he never hit more than 25 in a season. After his playing career, he coached for the Yankees and White Sox. He is one of six Detroit Tigers with a statue outside their ballpark (the others are Ty Cobb, Hank Greenberg, Al Kaline, Hal Newhouser, and Charlie Gehringer). Horton is credited as having been a calming influence on the public during the 1967 race riots in Detroit.